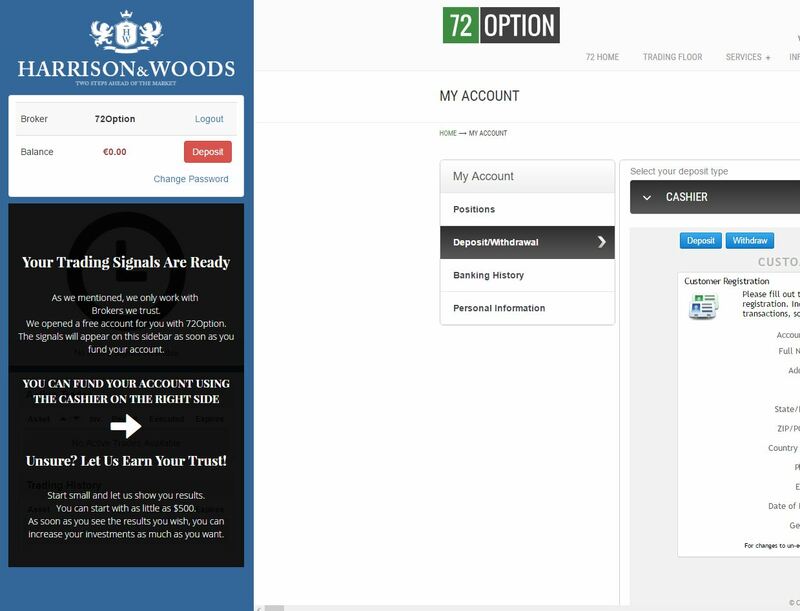 In this review we are going to have a look at the binary options signal service “Harrison & Woods“. Harrison & Woods want to make you believe that they are a real company with market analysts that can give you profitable binary options signals. Their signals allegedly have a 77 % win ratio, so if you execute them on your account, you will make money. When you read the Harrison & Woods disclaimer, you will learn that their signals are not meant to be investment advisory. So what a binary options signal is, if not an advice on how to invest?! You have to deposit at least $500. But the biggest warning sign is that you won’t be allowed to use Harrison & Woods trading signals unless you deposit at least $500 with their broker. And this is the typical sign of binary options scams, they promise you money, but you first have to deposit with a selected broker. If Harrison & Woods are really a good provider of signals, why don’t they let you try their signals on a demo? Why do you have to immediately risk your own money with an anonymous system and company? 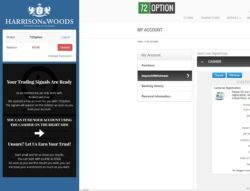 These unanswered questions make us believe that Harrison & Woods is just another binary options scam designed to make you deposit money with a certain broker, which will earn affiliate commissions to the scammers. So they don’t need to provide you with really profitable signals as they get paid by their broker for referring you as a depositor, you see? Our recommendation is to stay away from Harrison & Woods because they force you to deposit with a broker of their choice and risk your own money since the first trade with an anonymous system. Every serious system or signals provider should let you try their product on a free demo first so that you can verify the performance it is supposed to have.